The Tiger 131 is a German tier 6 premium heavy tank. This vehicle is the only Pz. Kpfw. VI Tiger in full working order. The vehicle was captured by the British 48th Royal Tank Regiment in Tunisia on April 21, 1943, and repaired later. It was shipped to the United Kingdom the same year. The British performed a full examination of the tank, and made it an exhibit item at the Bovington Tank Museum in 1951. - Has a standard camouflage print, so you can't choose your own camo-style. The Tiger 131 is practically the same tank as the Japanese Heavy Tank No.VI, but this one has better signal range. Still there are some rules to play this tank correctly. At first the gun isn't the best in tier VI. The penetration is not so good, the alpha damage is a bit lacking. But, your good aim time and accuracy makes up for the penetration, as you can fire more easely at enemy's weakspots and having more chance to penetrate them. The fast reload makes up for the bad alpha damage. The mobility isn't the best either, but with a good crew this isn't a problem. You aren't very likely to change flanks during battle, so choose your flank wisely. Your traverse speed is good, so angling your armor with dancing style is an option. The armor isn't good. It's flat and not very thick. Only in a tier IV match-up you can have bounces, but tier IV games are very rare for this tank. If you don't play tier IV game you must trust your enormous amount of hitpoints to out-trade your oppontents, but you will get penetrated most of the time, with exception of some lucky bounces. Play style is very different, according to your match-up. In a tier 4 game you are the most agrassive tank, 2-shooting enemy tier 4's and bouncings shots like a regular heavy tank. But if you are in tier 5/6 games you should rely on your enormous amount of hitpoints to out-trade your opponents, most of the time you will get the primary target because of bad armor and a large amount of hitpoints, like the TOG II*. If you are bottom tier, you are a less important target, so you can be sneaky. The accuracy of this tank isn't sniperlike, but good enough for second-line support. Use your teammates as main shield an shoot while your enemies are reloading. Your good aimtime helps with shooting weakspots. NEVER attack without any decent cover, your camouflage isn't good! This tank has also a standard camouflagestyle. As it is a premium vehicle, the Tiger 131 comes elite in stock configuration. Tiger 131 is a German Tiger I Heavy tank captured by the British 48th Royal Tank Regiment in Tunisia during World War II. 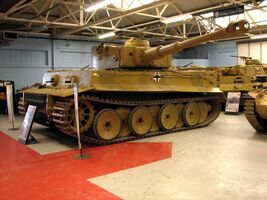 Preserved at The Tank Museum in Bovington, England, it is the only operational Tiger tank in the world. The damage that immobilized the turret on Tiger 131. 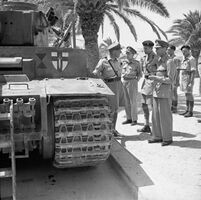 King George VI inspects Tiger 131, Tunis June 1943. The badge of the British First Army has been painted onto the tank. Tiger 131 at The Tank Museum in Bovington, England, 2008. Tiger 131 was painted in overall dunkelgelb, or dark yellow. The in-game camouflage, however, is a mixture of dunkelgrün (dark green) and dark yellow. This page was last modified on 4 September 2018, at 09:41.